This listing can be added to your bracelet order for engraving on one bracelet. The engraving will be on the inside of the bracelet, and can be up to 20 characters. Please add the text to be engraved in the comment section at checkout. If you would like to add engraving to multiple bracelets, please add that number to your cart, and be sure to specify which bracelet you want with each engraving. If you want the same text on multiple bracelets, please contact us. (It is $12 for each additional bracelet in this case.) *Please note*- We don't accept returns on bracelets with custom engraving. This silver bracelet, like her sister in gold filled, is where it all started. It has the gentle graceful curve and like most of my bracelets has a deep rich hammer blow. This develops a pattern as well as a play of light that dances across the surface as you move the bracelet around. This is a basic component to any group, and at the same time stands beautifully on it’s own. This bracelet is sterling silver, and is 3mm wide. This bracelet is similar to our original thin bracelet in size, but has couple new twists. It has a much smaller, and more sporadic hammer blow. Also, different than the curve of my other thin bracelets, this is a straight line bracelet.This bracelet compliments the other straight bracelets very well, yet it adds a neat affect to a group of curved bracelets. You can't go wrong adding this to a set of bracelets, yet it looks fantastic on it's own. This is a beautiful bracelet that provides a broader look than some of my other bracelets. It looks great on both men and women. It has a beautiful hammered texture that's different than that of my other bracelets. The light really dances off this bracelet. I originally made this style over 35 years ago, and couldn't be happier to reintroduce it to my bracelet fans. This bracelet is 11mm wide. 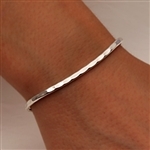 This cuff bracelet has a linear pattern in the sterling with a rich patina creating a nice contrast with the polished tube of sterling silver over top. It has my classic curve that swoops down toward the hand and then tucks in comfortably at the palm of the hand. This looks great with the thick straight line bracelets, and especially well with the thin bracelets that have the same curve. All the bracelets are adjustable. This cuff bracelet has a hammered surface on the niobium creating an elegant contrast to the polished tube of sterling silver over top. It has my classic curve that swoops down toward the hand and then tucks in comfortably at the palm of the hand. This looks great with the thick straight line bracelets, and especially well with the thin bracelets that have the same curve. All the bracelets are adjustable. 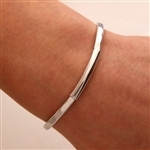 This is a beautiful, simple set of thin sterling silver bracelets. These bracelets all have the graceful curve and like most of my bracelets they have a deep rich hammer blow. They can be worn with the curves all flowing together, or intermingled as shown in the picture. This develops a pattern as well as a play of light that dances across the surface as you move the bracelet around. Each thin silver bracelet is a basic component to any group, and at the same time stands beautifully on it’s own.